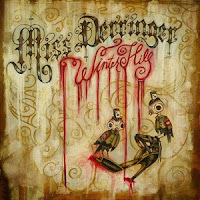 Quirky NY Chick: Video: Miss Derringer - "Click Click (Bang Bang)"
Miss Derringer, the band that consists of Liz McGrath (vocals), Morgan Slade (guitar), Sylvain de Muizon (bass), Cody James (drums) and Ben Shields (lead guitar) released their new record, Winter Hill, on July 14. Not familiar with them? Think a punked out Shangri La's or Blondie and you get the delight that is known as Miss Derringer. Check out the video for the opening track on Winter Hill, "Click Click (Bang Bang) below.